I really like doing stale kind of standing poses but they are rare because we feel bad asking the model to stand for 2 hours. This model was game though. 2 hours charcoal on 18"x24" drawing paper. note- I've updated the photograph of my painting below, its a little more representative of the real thing. 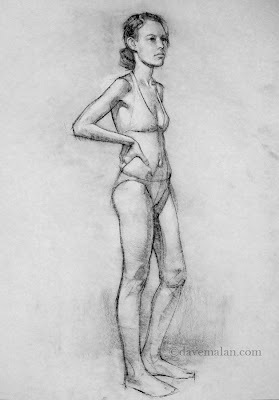 darn it, do you have to do a life drawing right after i come home from (a pathetically wasted) one? do you have any of your drawings/sketches available at higher resolution so that it would make a decent print at say A4 size? or do you only sell those? i would love to use some of them as a drawing tutorial. beautifully rendered. i really like how relaxed you were able to make her. she doesn't look in pain for standing 2 hours at all. sign of a true artist. Erik, you can email me with the email in my profile about what you are looking for and I can probably help. This is gorgeous. I simply love your line quality Dave.